MimiinDublin: I deleted a post by mistake! I had just finished a New Year post last night, and clicked on the delete button instead of publish! Damn! Happy New Year all, hope 2013 is great fun here in blogland. And healthy for us all so we can blog! 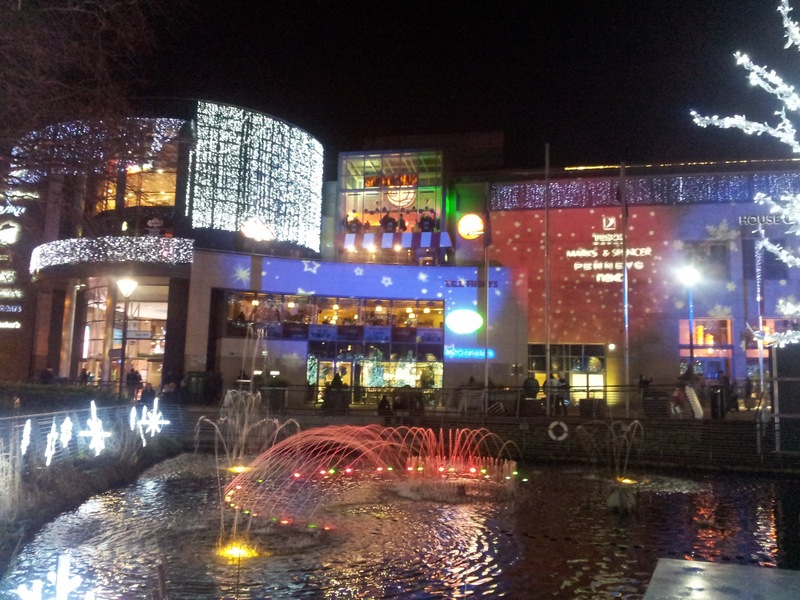 This is a photo Hubby took in the centre where we ate and went to the movie last Thursday night. It looks so festive! I've been very busy, but in a really lovely way, doing projects that were put on hold before Christmas due to lack of time. One is this marmalade: I bought organic oranges in July, didn't have time to make the marmalade so froze them. It was a blessing, when I defrosted them, the skin was so easy to cut, and the inside seemed to be all juice and no fibre! I just chopped up the 5 oranges, added a mug of water, simmered for 15 minutes, added same weight of jam sugar, boiled 6 minutes, and DONE! I love the jewelled colour, especially at this time of year! I often think about how foods and smells trigger memories. Saw a can of grapefruit segments in the supermarket and had to buy it. When I was little, we always had grapefruit segments for Christmas morning breakfast, followed by a fry-up. The diningroom table was set, with best linen and china, and when I eat these, I still feel the excitement that I did as a kid. Many foods that we had at Christmastime, we didn't have the rest of the year, so it was very exciting, not like now, when all foods are available all year round. I completed a knitting project, a hat for daughter for rowing. It's a beautiful chunky alpaca, and she's gone off to the lakes wearing it. I had the tiniest bit left! See! I'm still working on the lace scarf, hoping to get it finished before I return to school on Monday. Happy New Year my friend! Love that hat! All the best for 2013! Hope 2013 is good to you and your family. Looking forward to another year of interesting happenings in Dublin. Maybe we will see you on this side of the world? Love to Stephanie, you never know! My niece is still in BC, loving it! That was very fortunate about the wool being enough to finish the hat. It is lovely. I like the shade. Too bad about deleting the post. I am always worried I might do something like that. You have had a productive holiday! I have been lazy! And I am not looking forward to Monday. It will be so painful waking up early again. You know, it's funny, I just heard tonight from someone else for the first time that you could freeze limes and oranges. I had no idea! That marmalade looks wonderful. And the hat is so cute. I love alpaca wool. LUXURY!